Retro Ham Bites With Cream Cheese | Let's Cook With Bry! I cannot recall specifically whether these appeared on some party platter at a gathering thrown by my parents when I was a kid – and if they did, surely they were served with cellophane or multi-colored toothpicks. 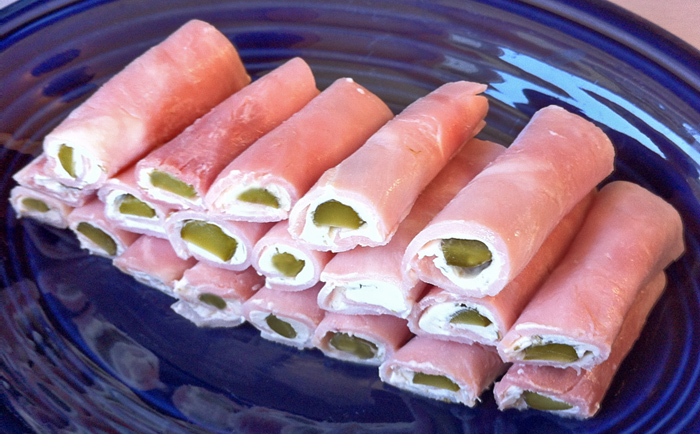 In any event, the combination of ham, pickle and cream cheese just SOUNDS retro, hence the name. I first made these for a holiday party about 15 years ago, and thought to recreate them for a recent party I threw of about 25 guests, for which I doubled the recipe. Lay the ham slice flat on a cookie sheet or other surface, and PAT DRY with a paper towel (this will help when spreading the cream cheese). 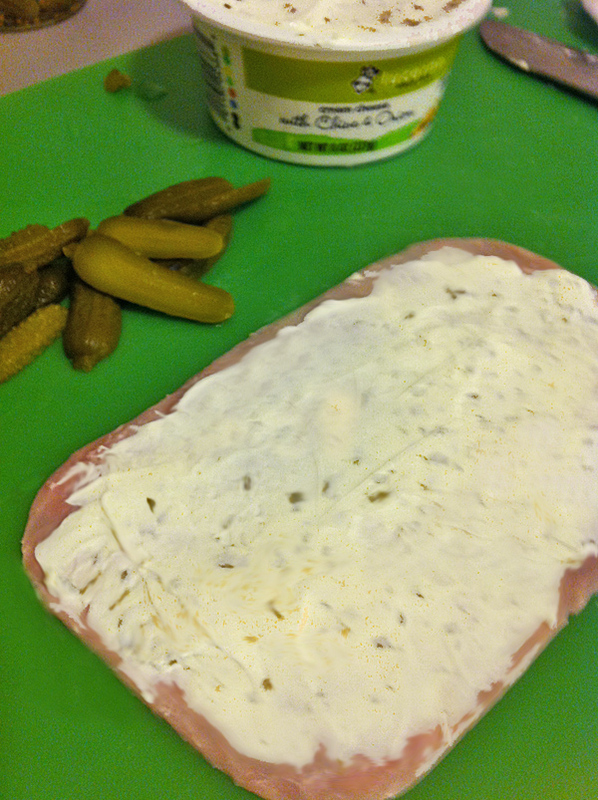 Spread about 2 tablespoons of the flavored cream cheese evenly across the ham. Place two pickle halves side by side at the end, and roll the ham over them; cut the ham horizontally, then halve the roll. Follow this process twice more with the remaining ham slice. For a more decorative presentation, you can horizontally slice one end off of each bite, as shown in the photo, before placing on a serving plate.